My 10-Speed goes to 11! 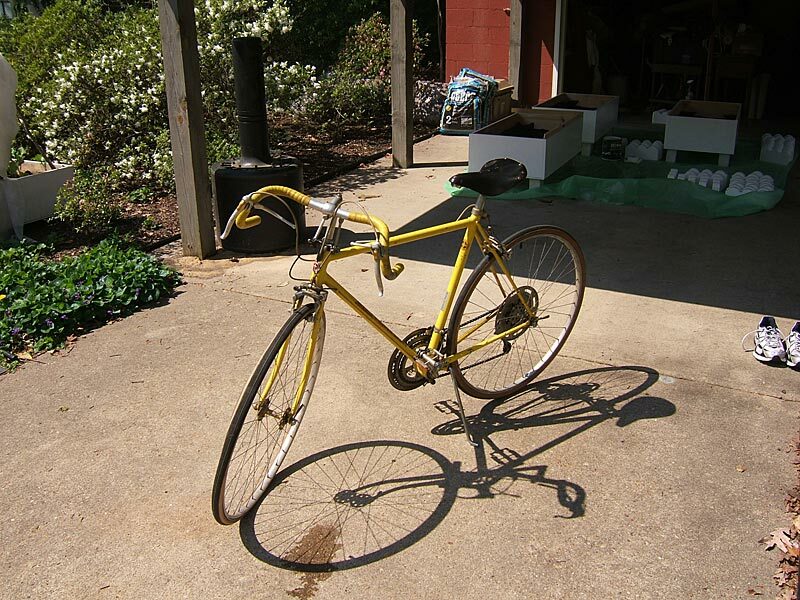 Another Schwinn has been rescued and rehabilitated during our Schwinnbatical. This time it’s a Schwinn Super Sport that got the much needed love and attention of it’s new owner, Thomas B. 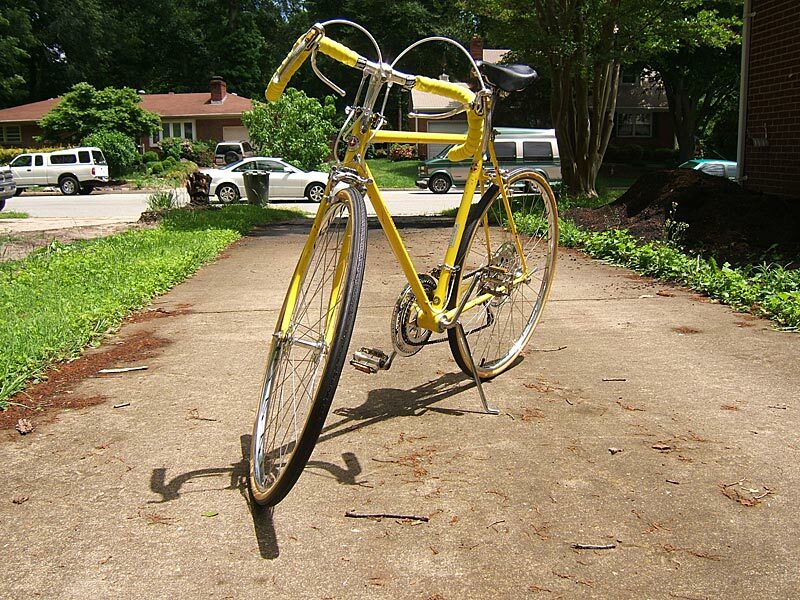 Here are pictures of my latest find, an early 70s Schwinn Super Sport. I paid $10 for it. 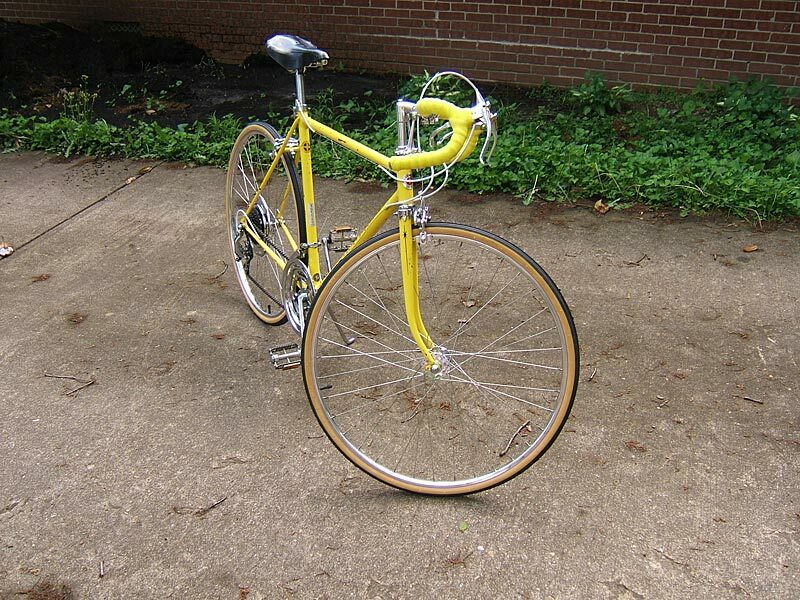 This was my first new Schwinn model back in highschool. I’m in the process of bringing it as close to its well deserved, lustrous beauty it once possessed. Some pitting on the metal will only allow me to make it shine like new if seen from a distance. Since purchase, I’ve torn it down to frame and cleaned everything, replaced the spokes, and recently purchased some yellow tape for the handlebars. I’d be very happy to see this bike placed amongst the others in OTS. The pictures shown are the before pictures. Once I put it back together, I’ll send the phoenix pictures as a comparison. Thank you. 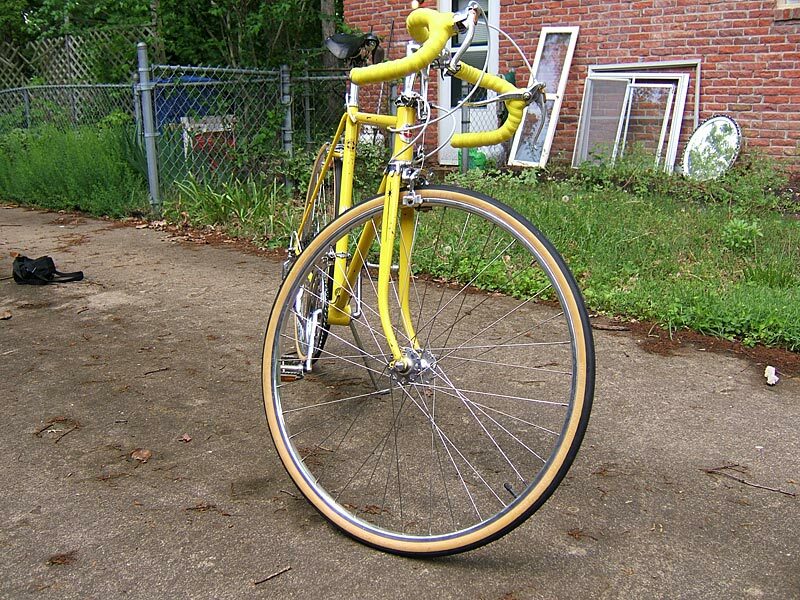 Tomshiba writes: Here are the phoenix pictures of my Schwinn Super Sport that I recently rebuilt. I haven’t dated the bike yet. I was more interested in getting it on the road. I figure it to be early 70s. I took the bike completely down to frame (except the kickstand), cleaned and shined most everything, replaced the tires, tape, spokes and cables. 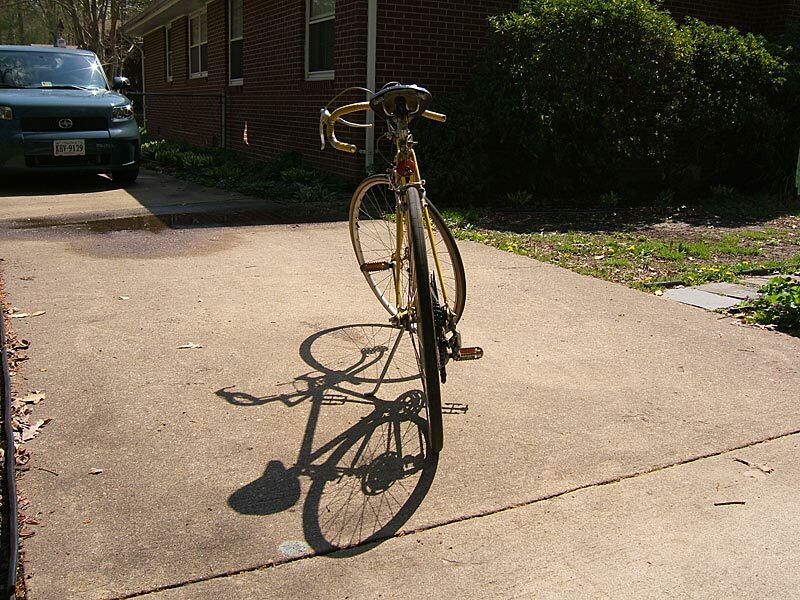 I spent much time on this project and really desire to let the sunlight play music on the spokes. The bike looks good but I have to deal with some pitting on the metal components. No matter, it looks good to me. As of now, this bike is a keeper. I hope to see these photos posted on your site. Thanks for the encouragement and inspiration. Thanks again. Nice work cleaning this up! It’s very similar to a yellow Super Sport which I missed out on getting from a garage sale last summer. Moral of the story, always have enough cash with you! That is a beauty! You have done an excellent job returning it to its former glory. The Super Sport frames were very nicely crafted. Back in the 1970’s, these were the official bicycle of the Wandering Wheels cross country tour. I am quite happy to see these machines saved from the fixie fad butchers. Thank you for your compliments. I did date it recently. It came out of the factory in March, 1974. I actually figured it to be a few years older. 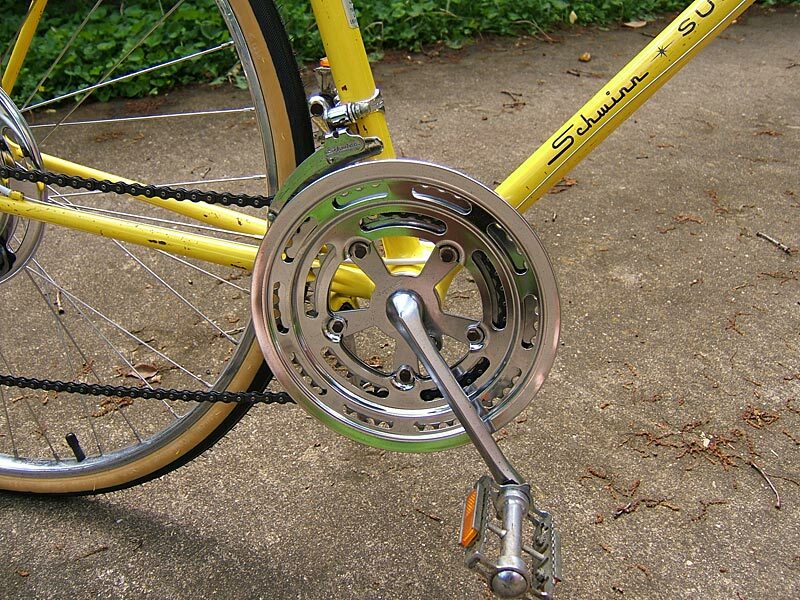 Apparently Schwinn saved money on tooling costs by running the same components for years to come. 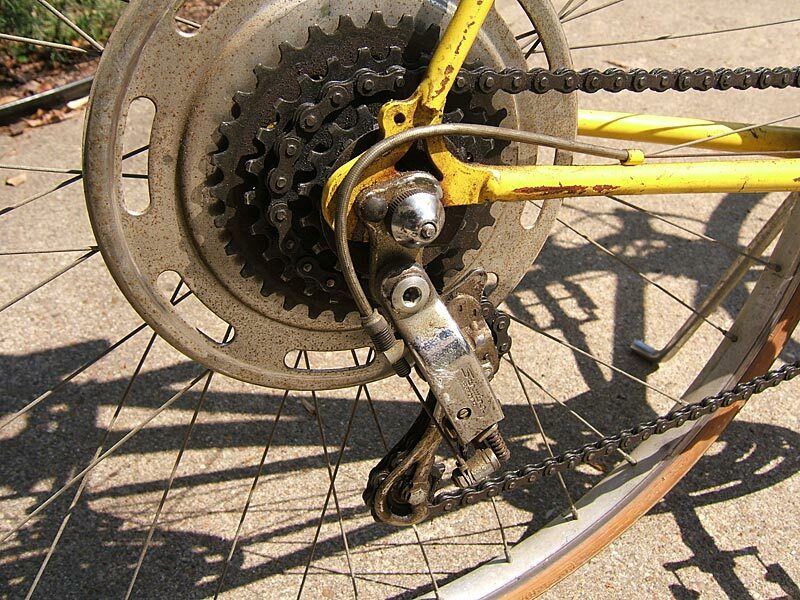 I do remember ten-speed bicycles taking on change around 1978, with a greater variety of components available. I want o do this again to another yard-sale refugee. BTW, it is comfortable to ride, but it definitely is heavier than anything I have ridden in three decades. I once owned a 1973 Buick 225 Limited that had 455 cubic inches under the hood; nice ride, very heavy and a fuel burner. I call this bike my classic car. Great job on the bike. It’s beautiful. 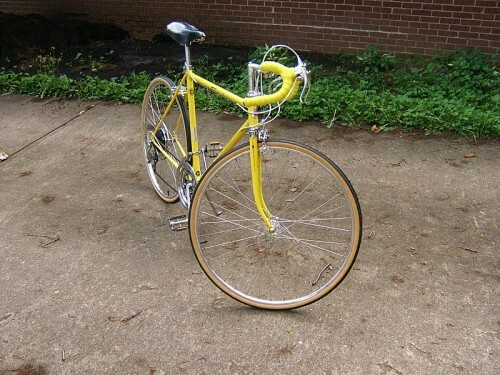 I just found a Kool Lemon Super Sport to buy for $150, and it looks to be in pretty good shape. Do you think that’s a fair price? I’m not an avid rider, and I would prefer an older bike, but I just don’t know what is reasonable. based on the fact that a reasonably decent bike nowadays will cost you $250 – $500, and you now have an original Chicago-built Schwinn (not like many bikes that are manufactured by a supplier and labelled under numerous names), I’d say shine it up, enjoy it and ride it with pride. Me personally, I have found nice bikes tossed out into the street because many people have neither the inclination or experience to fix them correctly and let the bike fade into disrepair. I am not in the business of buying, refurbishing and reselling for a profit (yet), I just enjoy bicycles. How can I get a whole container of old Scwhinns to New Zealand? Are you saying that you now possess a container of old Schwinns, or are just asking how to do it once you fill the container?? No I don’t posess a container of Schwinns. I live in New Zealand near Antartica and we dont jave many Scwhinn’s here.Where could I buy lots of old Scwhinns at bargain prices ? Enough to fill a smaller 20′ shipping container that is. The best answer I can give you is here, the United States, at yard/garage sales, thrift stores, etc. If you don’t mind paying idiotic shipping prices, E Bay is the next best thing along with Craigslist. I hope this helps. Do you sell your Super Sport. I had a pale blue one in 1973??? David, thanks for the interest, but this bike is special. I couldn’t sell it………..yet. Do send in photos. I’m sure other Super Sport fans would truly enjoy your progress. T.B. that bike is beautiful! I have a place in my heart for Super Sports! I’ve had mine since ’71 and it now has become a part of me! Here it is recently cleaned up and ready for the Woodward Dream Cruise here in Detroit. Not actually in the cruise, but I’ll be tooling up and down the avenue with it! It’s my classic vehicle!These S.S’s. give everything and I won’t buy another bike! I don’t need one! Enjoy it T.B.! Jim Wingo, that’s the same year that I purchased my SSS! I was a freshman in high school in Toledo. 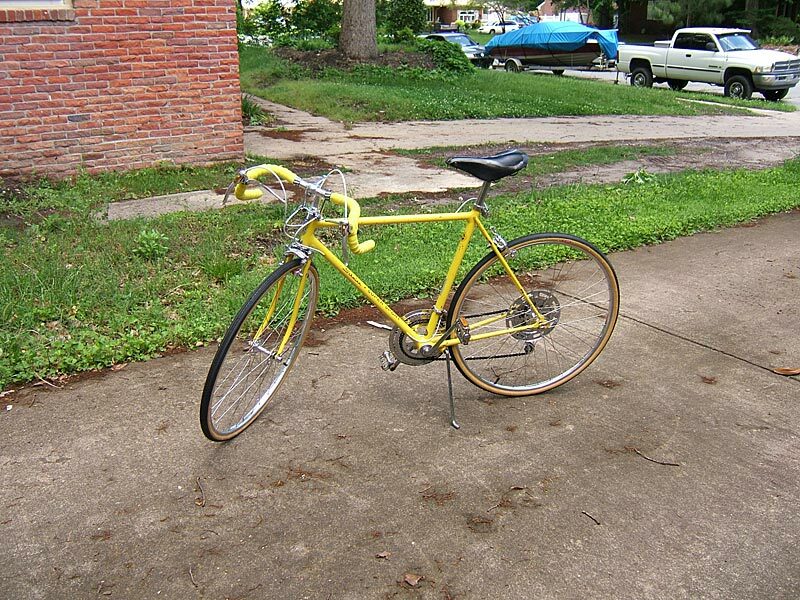 I ordered it from Miller’s Schwinn Cyclery in Maumee, Ohio that summer, and had to wait until September to pick it up. The newborn ten speed craze must have overburdened Chicago Schwinn. BTW, what color is it? Tried to post you a picture, but it wouldn’t download! Jim, it took this site at least a month and a half to post my photos. I wondered what happened but OTS came through and did it wonderfully. Be patient. You’ll be glad for the wait. Hi Tom! It’s a cool lemon. I’ve done a little customizing over the years to give it a little personality. I’ve used red tubing over the cable, a red and yellow handlebar tape, and a red water bottle carrier. 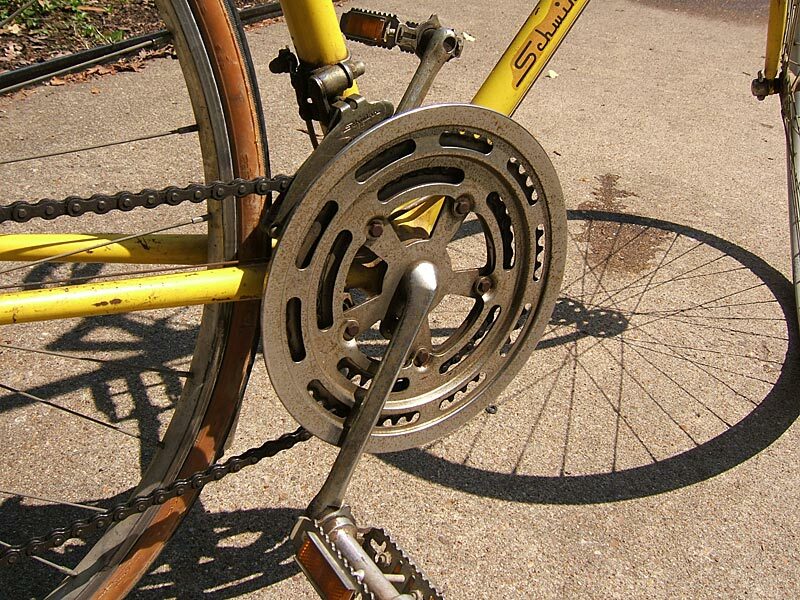 My original rear sprocket had begun to slip and I’d been picking up bikes at garage sales basically for my daughters. I had extras and was able to take the wheels off a relatively new girls Schwinn Traveler. That gave me a six sprocket gear in back and a derailleur problem. I was able to get it to the top sprocket by tightening the cable a bit. To solve the bottom sprocket problem I ended up taking an eighth inch piece of steel, cut and ground it to fit between the derailleur and frame and to my surprise it worked! I now have a twelve speed Super Sport! I tried to download a photo of what I did so if the picture shows up you’ll see the result! I copied them to this box because I couldn’t find anywhere else to download them. I found that the third cog on my SSS wore away somewhat and caused the chain to jump. I still keep an eye out for the five-speed cogs. They are so rare. Great job Tom. Yellow is such an underrated color. I just got a yelow Continental. Not sure what I’m going to do with it yet. As far as I know, it still has the original seat, handlebar grip tape and headlight & taillights. A badass bike that needs some work. God Bless. I just got this one cleaned up and running for a friend. 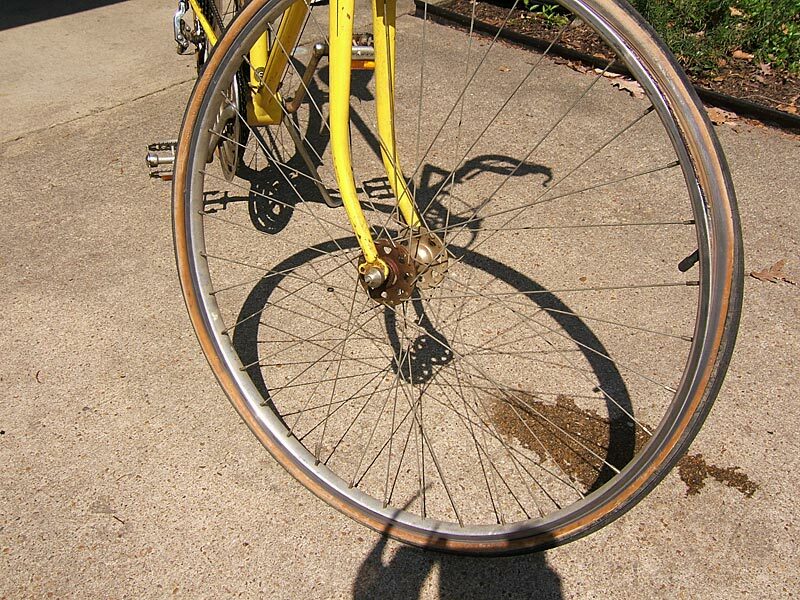 Previous owner actually taped the wrong size inner tube to the rim and rode it, had to respond the back wheel.